HONG KONG—Only 3-matches were played on Sunday Oct 19 in Hong Kong Hockey Association Premier Division. Hong Kong Cricket Club (HKCC) beat Kowloon Cricket Club (KCC) 1-0, Shaheen had their second win of the season (6-3) at the expense of KNS, Hong Kong Football Club-A (HKFC-A) won 5-3 against their HKFC-B side keeping A’s unbeaten record intact, but it was the match between Khalsa-A and SSSC-A that was the most significant. SSSC-A playing without their club Captain, who according to Singh Sabha convenor may well be out for at least two months due to the broken arm he sustained in last week’s match, put up a strong performance against Khalsa-A at the King’s Park Hockey Ground. This result puts SSSC-A on top of the standings on 15-points from 5 matches, Khalsa-A, Punjab and HKFC-A are on 12-points (but Punjab and HKFC-A have a game in hand). HKCC-A are on 7-points, and KNS-A, KCC-A, and Shaheen are all on 6-points. Valley-A have 4-points from just 3-games to date. A full set of fixture are scheduled for this coming Saturday Oct 25 (Women) and Sunday Oct 26 (Men). Women: At Sports Road, HKFC-B play Shaheen-A and HKFC-A play Valley-A; and at Happy Valley, Dutch-A play KCC-A. 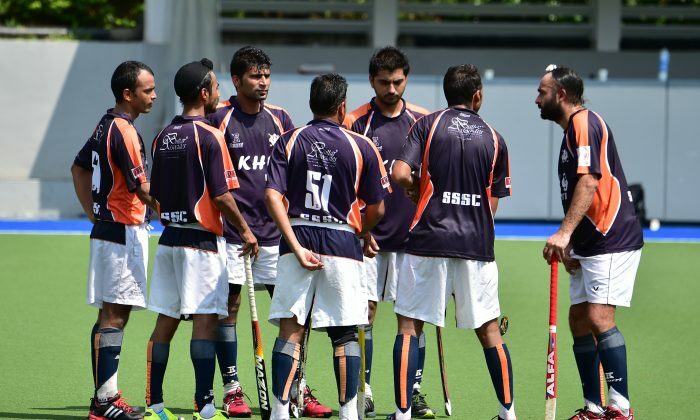 Men: At Sports Road, HKFC-B play Khalsa-A and HKFC-A meet KNS-A. At Happy Valley, Valley-A take on KCC-A and at King’s Park Pak-A play HKCC-A, Shaheen-A play Rhino, and Punjab-A play SSSC-A.